This four-year programme offers an additional year of study on top of the Theoretical Physics BSc, during which students have the opportunity to specialise further by taking advanced optional modules, and undertaking a research project. Mathematics, Physics and Further Mathematics required. A total of 18 points in three higher level subjects including Mathematics and Physics at grade 6, with no score below 5. D3,D3,D3 in three Cambridge Pre-U Principal Subjects, including Mathematics, Physics and Further Mathematics. AAA at Advanced Highers (or AA at Advanced Higher and AAA at Higher), including Mathematics and Physics at Advanced Higher. A science degree from UCL is a strong asset across the whole range of careers where basic scientific skills are required, from accountancy to astrophysics, and computing to cryogenics. The programme is accredited by the Institute of Physics (IOP) and includes the very latest developments and discoveries in the field, based on our highly rated research. Collaborative links with both industry and international research laboratories provide insight into the practical application of your studies. A wide range of optional modules are available, including modules from other University of London colleges, which allows for individual preferences and specialisations within your degree. This programme is accredited by the Institute of Physics. Holders of accredited degrees can follow a route to Institute of Physics membership and the Chartered Physicist (CPhys) professional qualification. Graduates of accredited Integrated Master's (MPhys or MSci) degrees have fulfilled the educational requirements for CPhys status, while graduates of accredited Bachelor's (BSc) degrees have partially fulfilled these requirements. Core modules in the first year provide a firm foundation in quantum and classical physics, underpinned by mathematics and a practical skills module which includes computing skills training. You will also take a module in practical mathematics. The second year includes core modules in quantum physics and its application to atoms and molecules, in statistical thermodynamics and in electromagnetic theory, along with further mathematics. The quantum and condensed matter elements of the core are completed in the third year. Students reading for the Theoretical Physics degree replace second and third-year experimental work with theory modules. 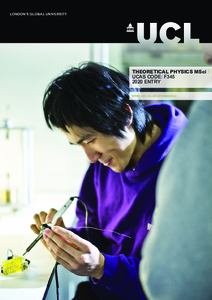 The third year also includes optional modules to develop further and enhance knowledge of a range of physics topics. The fourth year comprises a compulsory research project, and a further five half-credit modules, generally chosen from subjects in the relevant degree specialty. This programme is offered both as a three-year BSc and a four-year MSci, with common structures and subjects for the first two years. However, the additional fourth year of the MSci programme allows for a greater depth of study and we recommend you apply for an MSci initially, as this keeps more options open. All second-year modules are compulsory. You will select 2.5 credits from a wide range of optional modules. Teaching is delivered through lectures, laboratory (and as appropriate, observatory) practical sessions, and supervised problem-solving tutorials. These tutorials are designed to deal with lecture-based questions, enlarge on topics addressed in lectures, and allow clarification and in-depth discussion of new concepts. Assessment will normally involve end-of-year examinations, and an element of assessed coursework. Practical work you will be continuously assessed. Detailed course descriptions are available on the department website: Theoretical Physics MSci. Your scientific training will equip you with an understanding of mathematics, and of physical principles and techniques, as well as transferable skills in analysis, rational argument and innovative problem solving. Surveys by the IOP indicate that physicists' versatility is welcomed by a vast range of professions. Around half our graduates choose to pursue further study for an MSc or PhD. A PhD opens up the possibility of an academic or research career in a university or research institute. Alternatively, like many of our graduates, you may consider employment in research, design, development, computing, finance, marketing and teaching, among others. In addition to the subjects and grades specified in the qualifying examinations, we are also looking for evidence of self-motivation and an enthusiastic interest in the subject. This may be demonstrated through paid or voluntary work experience, academic project work, or your interests and hobbies beyond the school curriculum. Your application will be carefully assessed based on your UCAS form and reference. If you are made an offer and based in the UK within a reasonable travelling distance of UCL, you will be invited to a compulsory applicant open day. This will include presentations, a tour of facilities and an opportunity to meet current students and staff members. If you are based outside the UK, or not within reasonable travelling distance of UCL, open day attendance is optional and a telephone discussion with the admissions tutor will be available upon request.